Should I Use Free Online Storage? Google Docs is a pioneer in the free online storage market. This program allows you to store up to 5,000 documents and/or presentations with file size limitations of 500K for the document and up to 2MB per image that is embedded in the file. You can also store up to 1,000 spreadsheets in Google Docs with a maximum spreadsheet file size of 200,000 cells or 100 sheets. This program has several valuable features including the ability to lock your spreadsheets so people accessing your files can’t make changes, XLSX importing capabilities, complimentary themes for your forms and the ability to create and add drawings to your documents. Google Docs also works with Microsoft Office programs. Microsoft has their own free online storage program called Sky Drive. This program gives you up to 25GB of free storage. It is integrated with Xbox Live, Messenger and Hotmail, so if you have an account with one of the programs already then you can use your username and password from one of these accounts to access your Sky Drive account. To use Sky Drive all you have to do is drag and drop the files you want to store online into an online folder. Some of the features that make Sky Drive special include: SSL encryption, no 3rd party ads, 24/7 live support, file histories, cloud storage and remote access capabilities. Mozy is another first generation program that offers free online storage. The free version of this program gives you up to 2GB of storage and is compatible with Windows 2000, XP and Vista, as well as with Mac OSX 10.4 and 10.5. Mozy allows you to store any type of file you want and gives you the option of setting up an automatic backup schedule. A Drive is a simple free online storage option. You are given 50GB of storage space to use for movie files, documents and music files. Not only can you store your files on this site, but you can also edit documents and other files from the A Drive website. Badongo is a free online storage program that is set up like a social networking website. Not only do you get an unlimited amount of storage, but you can also create photo albums, music playlists and publish documents to share with other Badongo users. This site also offers free widgets that you can add to your blogs and websites. Box.net is unique in that it caters to businesses as opposed to a general audience. This program offers remote access, mobile access and desktop access to the files that you store in your Box.net account. The free version of this program is compatible with PCs, iPhones and Blackberries. It allows you to create five different collaborative folders, it gives you 1GB of free storage and allows you to upload files that are up to 25MB each. iDrive.com offers both free and fee based online storage. The free option gives you 2GB of storage, an automatic backup option, true archiving control, versioning options, mapped drive backup and continuous backup options. It also gives you a search and restore feature, which allows you to find the files that you want to restore. MediaFire is one of the few free online storage programs that gives you unlimited storage. However, while you can store as many files here as you want, there is a maximum file size of 100MB. Omemo.com is designed for social data storage. This means that it is designed for people who want to upload files to share with other people. There are no size limits imposed by this program, however, you do have to deal with third party advertisements. Omemo.com is compatible with Windows NT through Vista. While all of the above free online storage programs give you great storage and backup for your data files, it can be a bit of a hassle to access these files when you need them. Typically, you have to login to the online storage website, find your file, and download it to your hard drive. Not a big deal, but wouldn't it be much easier if you could treat your web-based storage like a local hard drive? One solution to this problem is to use a cloud integration program like Gladinet. This program will provide you with a quick link between your desktop and the files you are storing online. Gladinet allows users of Google Docs, SkyDrive, ADrive (and a few other online storage services) to access their web-based files just as if they were in a folder on a local hard drive. This program also offers extra encryption and upload/download acceleration for added convenience. Gladinet works on Windows XP/Vista, with Mac support coming soon. Most recent comments on "Free Online Storage"
Thank you for this great article! It's like many, many other terrific ones we get from you. One question and one comment: Can we upload our program files, too, so that if our computers get wiped out, we can download the program files and start over again? Re Mozy.com--I looked into using them once, but a FORMER customer of theirs put up a web page that really blasted them for horrible service. Mozy lost the person's files, but kept telling him they'd get the files to him later that day or the next morning or by Tuesday at the latest. You know--really insincere b.s. They sounded like a very dishonest and crass company, so I stayed away from them. Again, thank you for your excellent newsletter. EDITOR'S NOTE: I think most (if not all) of these services will let you upload any type of file. As for Mozy, they have lots of customers. And like any big company, they will have some vocal unhappy customers. I know some people that love it, so "your mileage may vary!" Bob: The Google solution is terrible as it doesn't allow users to copy multiple files at a time. A better solution that I found supports multiple file copying is MS Office Live Workspace (http://workspace.office.live.com). They also offer an option to integrate Office Live with your pc's MS Office Suite but I opted not to do this as I wanted to avoid possible violation of company policies at work. Thank you for your newsletters and valuable tips. I eagerly look forward to each. ADrive has saved me a few times. I recommend good file/folder organization before storing online, otherwise it might be hard to find things. diino.com - can use either the desktop GUI or the web interface. 5GB free storage. but user friendly. 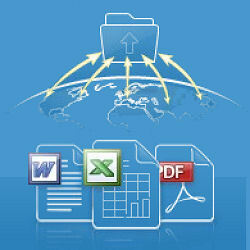 One great feature is the ability to right click and calculate the folder or file size. For at least some of these the user should remember to clean out the online storage recycle bin once in a while since it will count against storage limits. When using IDrive, if you lose the encryption key file, IDriveeGetEnc.exe, and have to reformat your computer, your account is gone and you have to open a new one with the loss of all previous backups...good security-wise, but risky, unless you make a backup of the file and store it on separate media and/or another web storage site. I wouldn't really call Mozy "storage." It's online backup. You can't access your files the way you can any old computer directory - you have to "restore" them. It's protection against computer failures, not a way to get stuff off your loaded machine. However, for that, it's a great deal and I've been happy with it. Drivehq.com offers 1 gB storage space for free. You even have the option of FTP upload / download which I find very convenient. They also sell paid accounts so the free option is somewhat hidden on the site. From the main page, click 'Online Storage & Sharing' (obviously) and then 'Pricing & Plans' on the left. You can download a filemanager from drivehq or use your own ftp-client. On the page drivehq.com/ftp you will find more info about the FTP option. Hello,i got a problem with my computer. When surfing through the internet for about two hours the window suddenly goes mad. The windows are broken everything comes scatted so i have to restart my computer again. The same thing will come up again during surfing the internet. I am using windows vista home basic. Would you help me with this problem please. EDITOR'S NOTE: If you really mean the windows on your desktop appear to "break" and scatter on your desktop, then something is terribly wrong. I've never heard of a virus that does that, but you should do a thorough malware scan. I find dropbox to be very useful in order to have my files synched in all my computers, as well as for folder's sharing. There's a new online storage company on the block called, Nomadesk. I tried it and signed up immediately. 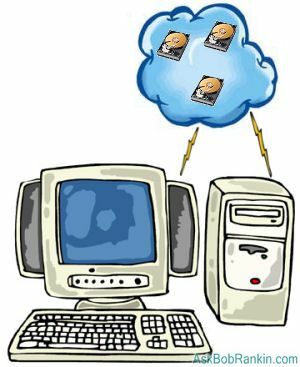 Nomadesk allows me to drag and drop my docs into a virtual file server or virtual drive just as I would my hard drive, so I can share, synchronize, backup and store everything in one place that can be accessed online and OFFLINE. It integrates will all of my apps, whereas I found Google Docs to change format when someone would make a change to a powerpoint slide...very frustrating. I set up multiple accounts and multiple file servers that I can share with unlimited guests with unlimited storage all for a flat $15/mo per file server. Your article is most informative. Thanks! I have used the starter edition of Gladinet for quite some time. I have successfully setup and used Skydrive but am unable to setup Google Docs, Google Picasa, and ADrive. I have searched everything I can think of but have had no luck in solving this issue. I keep finding evidence that it is possible to use these together. Can you provide any assistance or advice? Thanks! Well i find safecopy online backup so useful because one can backup more than 2computers on one account. The article is good however, dropboks.com is closed. In the comments, CloudDrive(www.driveoncloud.com) is really a tool for the Abode Online Storage. Nomadesk only offers a free TRIAL then you must pay. If you're not looking to store too much, look into FreeDrive. I use a combination of Google docs and Dropbox. Google docs when I work with others on a projects and Dropbox for more heavy stuff like graphics, themes etc. I am wondering... If Badongo is FREE and UNLIMITED... why wouldn't I sign up for that. I have a bunch of pictures that I would love to continuously store in the cloud. Currently I use Shutterfly because it is free and unlimited. I can see some of the advantages to google due to its connectedness to Android phones and Picassa. But why is there not more talk about Badongo. Is there something I am missing. FREE and UNLIMITED sound pretty great. Please let me know. Thanks. Hey Bob, Do you (or anyone else) have an answer for the question above about Bandago? I am wondering the same thing. EDITOR'S NOTE: I read the FAQ and it does seem like the "unlimited" claim is true, but if you use the free service, they throttle your download speeds, and display ads while you download. I've just seen "Copy" - https://www.copy.com/home/ - but there's very little information about it. How much will it store, and is it safe? I just found out about Dump Truck, an encrypted online storage and sharing site. "We own and manage our storage infrastructure and store three copies of every file using 256-bit AES encryption to deliver the highest levels of privacy and security." Anyone can get a 5GB account for free. If you also signup for VyprVPN service, you can get from 10GB to 50GB of storage, depending on the plan you buy. http://www.goldenfrog.com/dumptruck - Dump Truck only. http://www.goldenfrog.com/vyprvpn/buy-vpn VPN with Dump Truck. Great article, once again. Just wanted you to know the link you provided for Badongo seems to not work correctly. Whe I clicked on it, after two minutes of watching a spinning wheel before page load, the page that loaded said "you have not signed in". It works the good 'ole www.badongo.com way, though! Again, thanks for the info.